Last time I made 2 rice balls mixed with tomato sauce. Today, I made 2 rice balls mixed with light soy sauce and decorated them as doggies. The ears were made of fish cake and nose was made of small grapes and the white part of crab stick. Both ears and nose were attached to rice ball using spaghetti stick. For the others facial parts, I used nori and red part of crab stick. Inside the box : laksa prawns, cauliflower, sauteed pok choy, omelet & carrot, and strawberries. Today is Wednesday, don't forget to join "What's for Lunch" and put your bento link there. Hope your migraine is not that serious. Better go get some consultations if it persist coz you might not know what is wrong. The doggies look yummy, if i may say! @Journal Mommy Yenny : Holiday again? Woohoooo ... I would love too but can't lah hehehe :D I'm okay now after had a good and better sleep last night. Thanks a lot Yen! Glad to hear you are better! Lovely bento as always. Nice to know that we can use food to do facial details apart from the common nori. Take good care of yourself ya! Super cute doggies! I like the facial details a lot, you put in so much details there! those teeny-tiny grape noses are making me squeal!! love these cute doggies, and the prety omelette-carrot "sushi" -- beautiful job as always lia! SO cute! Sorry for your migraine. I hope it leaves you alone for a long time. Love these little doggies! Talk about attention to detail.. they look like they're ready for school too with their little book packs beside. Well, looks like it to me! Hope you're feeling better today Lia..
U know when I loaded your page, Kimi screamed in delight and said, Mummy! So cute the doggies!! I want!!" I had to swallow the lump in my throat and say, "ok, mama will try one day for you ok?" Love the mini grapes! So apt for the nose! Hope you are feeling beta now with your migraine. Don't forget to ask our Great Loving Healer, Jesus to make you feel better ok? Btw, not sure you heard of FitFlop. It helps with backache. I've worn that for abt 2 weeks and I feel my backache is sooooo much beta. Take care and May Jesus lay His Healing hands on you so that you will not be in pain and be whole. Shalom! Your puppies are adorable! I am loving the teeny tiny grape noses! I sure hope your migraine is gone and will stay away. I hate having to deal with any type of headaches! Take care! I missed this this morning! It's just darling, I love the doggies and the omelets look delicious. I love the doggies. They are very cute. Yes, Lia, if you get constant migraines, it might be a good idea, like Angeleyes said, to seek an opinion with the doctor. Not trying to scare you, but my friend had migraine all the time and consulted a doc. She just had surgery done. If it happens only once in a while then I guess it is just normal migraine. Take care. So sorry to hear about your migraine...hope it's better by now! 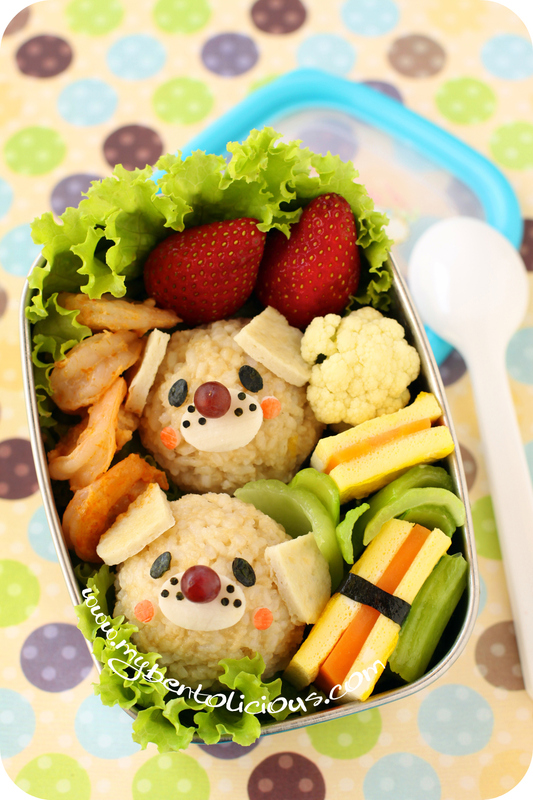 This bento is so adorable!! I'm sorry to hear about your migraine and pains :( Hope you get to feeling better!! Glad that you are feeling a bit better. Weather related maybe? I get bad headaches when our weather shifts. Hi Lia! Love the doggies and I hope you get well soon. @Shannon : Thanks a lot to organize a fun event too! I'm glad I can join :) Weather shifts sometimes make trouble, but I think it comes from my low blood pressure. Hi Lia, The doggies look so cute. Those big eyes look exactly like my pet dog...hhaa..
Dear Lia, hope the pain are all gone and you are feeling wonderful today! Thanks for the smiles from this adorable doggie bento--such expressive cute faces! @Anncoo : Thanks a lot Ann! I posted my comment in your blog. Hope you can view it this time. Why did you change it to the new system? Hi Lia, Thanks, your comment already in my system. Because of the heavy traffic I would like to answer my bloggers individually. So now I'm waiting for the help from the support team.